ADINA FSI is the industry-leading product for simulating fully coupled fluid-structure interactions. Through direct and iterative coupling schemes, ADINA FSI offers a reliable and robust approach to challenging problems, such as large deformations of soft structures or highly compressible flows abutting stiff structures. Fluid-structure interaction (FSI) occurs when fluid flow causes deformation of the structure. This deformation, in turn, changes the boundary conditions of the fluid flow. The banner image above shows the fluid-structure interaction analysis of a membrane valve. Here, the fluid pressure deforms the membrane which changes the boundary conditions of the flow. ADINA offers fluid-structure interaction capabilities in one single program for the solution of problems where the fluids are fully coupled to general structures that can undergo highly nonlinear response due to large deformations, inelasticity, contact and temperature-dependency. A fully coupled fluid-structure interaction means that the response of the solid is strongly affected by the response of the fluid, and vice versa. From the fluid point of view, the Navier-Stokes flow can be incompressible, slightly compressible, low-speed or high-speed compressible. From the structural point of view, all available element types can be used (i.e. shell, 2-D and 3-D solid, beam, iso-beam, contact surfaces, etc.) as well as all available material models. Additionally, ADINA offers very efficient fully coupled fluid-structure interaction capabilities in which the fluid is assumed to be an acoustic medium. where d and f are displacements and tractions, and the subscripts f and s stand for fluid and solid, respectively. In transient analyses, like the simulation of the membrane valve shown above, a second-order time integration scheme can be used. In the Direct FSI Coupling solution method the fluid and solid equations are combined and treated in one system (one stiffness matrix), linearized and solved using an iterative algorithm such as the Newton-Raphson method. The Direct FSI Coupling algorithm offers great robustness when solving very difficult FSI problems, for example, large deformations with "soft" structures or highly compressible flows abutting very stiff structures. These types of problems are difficult to solve using the Iterative FSI Coupling. The fluid and solid equations are solved individually, in succession, always using the latest information provided by the other part of the coupled system. The Iterative FSI Coupling solution method requires less memory than the Direct FSI Coupling method and therefore may be more applicable to solve very large problems. The unique offering of the two procedures, Iterative and Direct FSI Coupling, provided by ADINA is essential to successfully solve a wide range of problems in the most efficient way. ADINA combines in one single program state-of-the-art computational solid and fluid dynamics schemes. For fluid flow analysis the user can choose between a vertex-based FCBI (Flow-Condition-Based Interpolation) scheme and a cell-based FCBI-C scheme. FCBI finite element scheme: A flow-condition-based interpolation of the velocities is used to provide stability. The finite element equations are assembled calculating consistent Jacobian matrices in the Newton-Raphson iterations. Hence, consistent stiffness matrices can be established for the complete fluid-structure system which makes it possible to solve very complex practical problems with highly nonlinear response. FCBI-C finite element scheme: All solution variables are defined in the center of the element and the coupling between the velocity and the pressure is handled iteratively. Therefore, in FSI analysis the coupling between the solid and fluid models is also handled iteratively. This scheme allows the solution of very large practical problems. These schemes are applicable to any Reynolds number flow, from low to high Reynolds numbers. Once any part of the computational domain deforms, the Eulerian description of the fluid flow is no longer applicable. Therefore, ADINA solves the governing equations of fluid flow using an Arbitrary-Lagrangian-Eulerian (ALE) formulation. The FCBI scheme provides great stability, and is applicable to problems with both very high and very low Reynolds numbers. 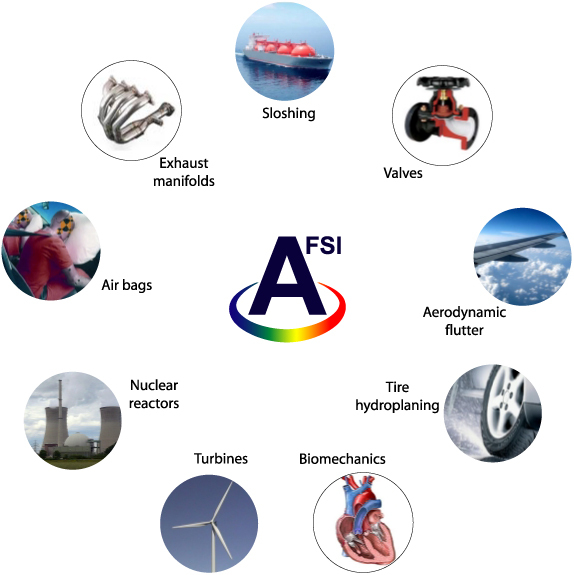 FSI analysis can be carried out with all flow types, namely incompressible, slightly compressible, low-speed compressible, and high-speed compressible flow. In addition, all fluid material models including non-Newtonian fluids, turbulence models and the VOF method are available for FSI analyses. 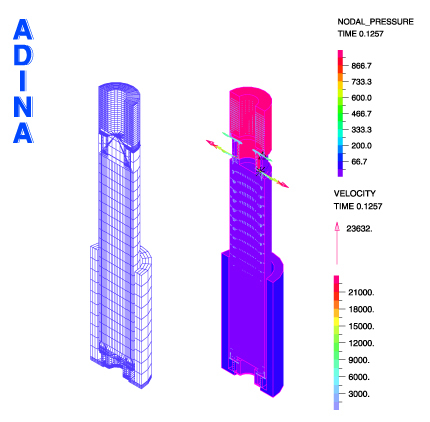 In FSI analyses in which large displacements of the structure occur, ADINA provides advanced moving mesh capabilities to adequately control the mesh quality, including leader-follower constraints, slipping boundaries, and the extended wall feature. These ALE conditions ensure that the moving mesh quality is maintained in the presence of large structural deformations. To further increase the generality of the FSI solution capability, and the accuracy in solutions, ADINA offers the capability to adapt and repair CFD meshes so that appropriate mesh grading is used, and very large deformations of a structure can be accommodated. This adaptive meshing technique operates on CFD solution gradients and involves refining and coarsening the mesh in various regions of flow for adequate element sizes throughout the fluid region. Potential-based fluid elements are available for efficient FSI analysis with acoustic flows. The potential-based fluid elements may also be used to perform frequency analysis of structures interacting with acoustic flows. ADINA allows the use of arbitrary meshes in the fluid and solid models. Furthermore, the fluid and solid meshes do not have to match perfectly at the fluid-structure interface. Thermal and porous coupling is available between the fluid and the structural models. All structural elements, the contact capabilities and the solid material models (i.e., elastic, viscoelastic, rubber, plasticity, etc.) are available for FSI solutions. Gap boundary conditions can be represented in the fluid models. The gap boundary condition, combined with the contact capabilities in ADINA have been used successfully to model the opening and closing of valves in automotive and biomedical applications. FSI analysis with sliding-mesh capability is available. Combining sliding meshes with FSI capabilities is particularly useful to analyze rotating equipment and turbomachinery. An efficient option can be the automatic one-way-coupled FSI analysis. This type of analysis is very useful when deformations in the solid are small and their influence on the fluid response is negligible. Therefore, no iteration between the fluid and the solid models is needed. Fluid containers — oil tanks subject to earthquake, fuel tank sloshing, etc. Biomechanics — cardiovascular mechanics, cerebrospinal mechanics, implant/prosthetic design, cell/tissue mechanics, artificial lung, drug delivery, eye disease, ventricular assist devices, carpal tunnel, vocal fold/upper airway, artificial heart valves, aneurysms, bile flow, bioreactors, etc. Turbomachinery — impellers, gas turbines, wind turbines, etc. Nuclear power plants — control rod drop, blowdown condition, etc. Wind engineering — effect of wind on tall buildings, cable stayed bridges, etc. Compressors, Pumps, Valves and Pipe Systems — gear pumps, impedance pumps, check valves, membrane valves, etc. Seals — hydrodynamic seals, face seals, brush seals, etc. Other applications — vortex-induced vibrations (VIV), journal bearings, parachute deployment, paper industry, printers, submerged structures (submarines, dam radial gates, etc. ), loudspeakers, hearing aids, hydro-fracture (flow through cracked media), metal hydro-forming, etc. A. Al-Amiri, K. Khanafer, "Fluid-structure interaction analysis of mixed convection heat transfer in a lid-driven cavity with a flexible bottom wall", International Journal of Heat and Mass Transfer, 54:3826-3836, 2011. M. Malve, A. Perez del Palomar, A. Mena, O. Trabelsi, J.L. Lopez-Villalobos, A. Ginel, F. Panadero, M. Doblare, "Numerical modeling of a human stented trachea under different stent designs", International Communications in Heat and Mass Transfer, 38(7):855-862, 2011. Pahlevan N. M., Gharib M., "Low pulse pressure with high pulsatile external left ventricular power: In?uence of aortic waves", Journal of Biomechanics 44:2083-2089, 2011. B. Miquel, N. Bouaanani, "Practical dynamic analysis of structures laterally vibrating in contact with water", Computers & Structures, 89:2195-2210, 2011. Pahlevan N. M., Amlani, F., Gorji, M.H., Hussain, F., and Gharib M., "A Physiologically Relevant, Simple Out?ow Boundary Model for Truncated Vasculature", Annals of Biomedical Engineering, 39(5):1470-1481, 2011. Wang R., Wang Y., and Guo X., "Rotordynamic Analysis for a Turbo-Machine with Fluid-Solid Interaction and Rotation Effects", Mathematical Problems in Engineering, Volume 2011, Article ID 921095, 2011. Suh D.C., MD, Ko Y.B., Park S.-T., Yoon K., Lim O.K., Oh J.S., Jeong Y.G., BS1, Kim J.S., "Computational Flow Dynamics of the Severe M1 Stenosis Before and After Stenting", Neurointervention, 6:13-16, 2011. Hao, Q., "Modeling of Flow in an In Vitro Aneurysm Model: A Fluid-Structure Interaction Approach", University of Miami Open Access Dissertations, Paper 508, 2011. B.C. Konala, A. Das, R.K. Banerjee, "Influence of arterial wall-stenosis compliance on the coronary diagnostic parameters", Journal of Biomechanics, doi:10.1016/j.jbiomech.2010.12.011, 2011. D. Tang, C. Yang, T. Geva, G. Gaudette, P.J. del Nido, "Multi-physics MRI-based two-layer ?uid-structure interaction anisotropic models of human right and left ventricles with different patch materials: Cardiac function assessment and mechanical stress analysis", Computers and Structures, In press 2011. D.C. Suh, Y.B. Ko, S.-T. Park, K. Yoon, O.K. Lim, J.S. Oh, Y.G. Jeong, J.S. Kim, "Computational Flow Dynamics of the Severe M1 Stenosis Before and After Stenting", Neurointervention, 6:13-16, 2011. M. Malve, A. Perez Del Palomar, S. Chandra, J.L. Lopez-Villalobos, A. Mena, E.A. Finol, A. Ginel, and M. Doblare, "FSI Analysis of a Healthy and a Stenotic Human Trachea Under Impedance-Based Boundary Conditions", Journal of Biomechanical Engineering, 133:02001-1-02001-12, 2011. E.J. Weinberg, P.J. Mack, F.J. Schoen, G. García-Cardeña, M.R.K. Mofrad, "Hemodynamic environments from opposing sides of human aortic valve leaflets evoke distinct endothelial phenotypes in vitro", Cardiovasc Eng, 10:5-11, 2010. N.S. Ha, N.S. 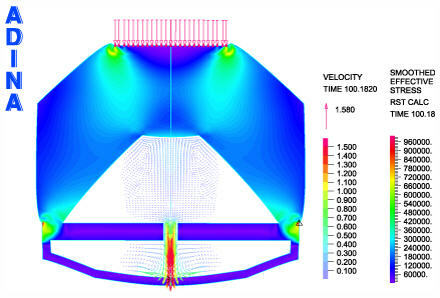 Goo, "Propulsion modeling and analysis of a biomimetic swimmer", Journal of Bionic Engineering, 7:259-266, 2010. C. An, Y. Cai, "The effect of beach slope on the tsunami run-up induced by thrust fault earthquakes", Procedia Computer Science, 1:645-654, 2010. M. Malve, A. Perez del Palomar, O. Trabelsi, J.L. Lopez-Villalobos, A. Ginel, M. Doblare, "Modeling of the ?uid structure interaction of a human trachea under different ventilation conditions", International Communications in Heat and Mass Transfer (In press 2010). Z. Pei and C. Yu, "Numerical study on the effect of nozzle pressure and yarn delivery speed on the fiber motion in the nozzle of Murata vortex spinning", Journal of Fluids and Structures (In press 2010). S. Wei and L. Zhang, "Vibration analysis of hydropower house based on fluid-structure coupling numerical method", Water Science and Engineering, 3(1):75-84, 2010. S.L. Thomson, "Shape Optimization and Fluid Dynamic Analysis of a Translating Flexible Body", Proc. 48th AIAA Aerospace Sciences Meeting Including the New Horizons Forum and Aerospace Exposition, AIAA 2010-1432, 2010. G. Mylavarapu, M. Mihaescu, E. Gutmark, S. Murugappan, and M. Kalra, "Fluid Structure Interaction Analysis in Human Upper Airways to Understand Sleep Apnea", Proc. 48th AIAA Aerospace Sciences Meeting Including the New Horizons Forum and Aerospace Exposition, AIAA 2010-1264, 2010. M.G. Doyle, S. Tavoularis, and Y. Bourgault, "Application of Parallel Processing to the Simulation of Heart Mechanics", D.J.K. Mewhort et al. (Eds. ): HPCS 2009, LNCS 5976, pp. 30-47, 2010. J.R. Leach, V.L. Rayz, M.R.K. Mofrad, D.Saloner, "An efficient two-stage approach for image-based FSI analysis of atherosclerotic arteries", Biomech Model Mechanobiol, 9:213-223, 2010. J.R. Leach, V.L. Rayz, B. Soares, M. Wintermark, M.R.K. Mofrad, and D. Saloner, "Carotid Atheroma Rupture Observed In Vivo and FSI-Predicted Stress Distribution Based on Pre-rupture Imaging", Annals of Biomedical Engineering, DOI: 10.1007/s10439-010-0004-8, 2010. Z. Zeng, B.J. Chung, M. Durka, and A.M. Robertson, "An In Vitro Device for Evaluation of Cellular Response to Flows Found at the Apex of Arterial Bifurcations", R. Rannacher, A. Sequeira (eds. ), Advances in Mathematical Fluid Mechanics, Springer-Verlag, Berlin/Heidelberg, 2010. M. Malvé, A. Pérez Del Palomar, J.L. López-Villalobos, A. Ginel, and M. Doblaré, "FSI Analysis of the Coughing Mechanism in a Human Trachea", Annals of Biomedical Engineering, 38(4): 1556-1565, 2010. C. D. Bertram, "Evaluation by Fluid/Structure-Interaction Spinal-Cord Simulation of the Effects of Subarachnoid-Space Stenosis on an Adjacent Syrinx", Journal of Biomechanical Engineering, Vol. 132, June 2010. T.Q. Le, D. Byun, Saputra, J.H. Ko, H.C. Park, M. Kim, "Numerical investigation of the aerodynamic characteristics of a hovering Coleopteran insect", Journal of Theoretical Biology, 266: 485-495, 2010. Z.Y. Li, C. Zhu, Z. Teng, and J.H. Gillard, "Stress Analysis of Carotid Plaque Based on in Vivo MRI of Acute Symptomatic and Asymptomatic Patients", WCB 2010, IFMBE Proceedings 31, pp. 891-894, 2010. U. Sadat, Z. Teng, V.E. Young, C. Zhu, T.Y. Tang, M. J. Graves, J.H. Gillard, "Impact of plaque haemorrhage and its age on structural stresses in atherosclerotic plaques of patients with carotid artery disease: an MR imaging-based finite element simulation study", Int J Cardiovasc Imaging, DOI 10.1007/s10554-010-9679-z, 2010. H. L. Dailey and S. N. Ghadiali, "Influence of power-law rheology on cell injury during microbubble flows", Biomechanics and Modeling in Mechanobiology, 9(3):263-279, 2010. Z. Aronis, E. Massarwa, L. Rosen, O. Rotman, R. Eliasy, R. Haj-Ali, and S. Einav, "Numerical Analysis of a Novel Method for Temperature Gradient Measurement in the Vicinity of Warm Inflamed Atherosclerotic Plaques", MEDICON 2010, IFMBE Proceedings 29, pp. 584-587, 2010. Y. Choi, J. Lee, W. Jeong, and I. Kim, "Dynamic behavior of valve system in linear compressor based on fluid-structure interaction", Journal of Mechanical Science and Technology, 24(7):1371-1377, 2010. S.M. Hasheminejad, A. Bahari, S. Abbasion, "Modelling and simulation of acoustic pulse interaction with a fluid-filled hollow elastic sphere through numerical Laplace inversion", Applied Mathematical Modelling, 35:22-49, 2010. H. Liu, H. Xu, P.J. Ellison, Z. Jin, "Application of Computational Fluid Dynamics and Fluid-Structure Interaction Method to the Lubrication Study of a Rotor-Bearing System", Tribol. Lett., 38:325-336, 2010. R. Huang and Q. Rong, "Respiration Simulation of Human Upper Airway for Analysis of Obstructive Sleep Apnea Syndrome", LSMS/ICSEE 2010, LNBI 6330, pp. 588-596, 2010. H.M. Chae and C.N. Kim, "A Numerical Study with FSI Mode on the Characteristics of Pressure Fluctuation and Discharge Valve Motion in Rotary Compressors with Single and Dual Muffler", International Journal Of Precision Engineering And Manufacturing, 11( 4):589-596, 2010. Z. Liu, X. Xu, F.F.J. Lim, X. Luo, A.Van Hirtum, and N.A. Hill, "Modeling and Simulation of Human Upper Airway", WCB 2010, IFMBE Proceedings 31, pp. 686-689, 2010. B. Sweetman and A.A. Linninger, "Cerebrospinal Fluid Flow Dynamics in the Central Nervous System", Annals of Biomedical Engineering, DOI: 10.1007/s10439-010-0141-0, 2010. S.-M. Lin, "Effective dampings and frequency shifts of several modes of an inclined cantilever vibrating in viscous ?uid", Precision Engineering, 34: 320-326, 2010. H.Y. Chen, J.A. Navia, S. Sha?que, G.S. Kassab, "Fluid-structure interaction in aortic cross-clamping: Implications for vessel injury", Journal of Biomechanics, 43(2): 221-227, 2010. S. Hwang, S.-G. Lee, C.-S. Ahn, D.-B. Moon, K.-H. Kim, K.-B. Sung, G.-Y. Ko, T.-Y. Ha, G.-W. Song, D.-H. Jung, D.-I. Gwon, K.-W. Kim, N.-K. Choi, K.-W. Kim, Y.-D. Yu, and G.-C. Park, "Morphometric and Simulation Analyses of Right Hepatic Vein Reconstruction in Adult Living Donor Liver Transplantation Using Right Lobe Grafts", Liver Transplantation, 16:639-648, 2010. D. Tang, C. Yang, T. Geva, P.J. del Nido, "Image-based patient-speci?c ventricle models with ?uid-structure interaction for cardiac function assessment and surgical design optimization", Progress in Pediatric Cardiology, 30:51-62, 2010. X. Huang, Z. Teng, G. Canton, M. Ferguson, C. Yuan, D. Tang, "Intraplaque hemorrhage is associated with higher structural stresses in human atherosclerotic plaques: an in vivo MRI-based 3d fluid-structure interaction study", BioMedical Engineering OnLine, 9:86, 2010. Z. Zhang & X. Zhang, "Mechanical behavior of the erythrocyte in microvessel stenosis", Sci China Life Sci, doi: 10.1007/s11427-011-4152-3, 2010. C. Yang, G. Canton, C. Yuan, M. Ferguson, T.S. Hatsukami, D. Tang, "Advanced human carotid plaque progression correlates positively with flow shear stress using follow-up scan data: An in vivo MRI multi-patient 3D FSI study", Journal of Biomechanics, 43(13): 2530-2538, 2010. M. Xenos, S.H. Rambhia, Y. Alemu, S. Einav, N. Labropoulos, A. Tassiopoulos, J.J. Ricotta, and D. Bluestein, "Patient-Based Abdominal Aortic Aneurysm Rupture Risk Prediction with Fluid Structure Interaction Modeling", Annals of Biomedical Engineering, 38(11):3323-3337, 2010. M. Xenos, Y Alemu, D. Zamfir,S. Einav, J.J. Ricotta, N. Labropoulos, A. Tassiopoulos, D. Bluestein, "The effect of angulation in abdominal aortic aneurysms: fluid-structure interaction simulations of idealized geometries", Med Biol Eng Comput, 48:1175-1190, 2010. T. S. Oh, Y.B. Ko, S.-T. Park, K. Yoon, S.-W. Lee, J.W. Park, J.L. Kim, B. Kim, S.-O. Park, J.S. Kim, D.C. Suh, "Computational Flow Dynamics Study in Severe Carotid Bulb Stenosis with Ulceration", Neurointervention, 5:97-102, 2010. Chun Yang, Richard G. Bach,Jie Zheng, Issam Ei Naqa, Pamela K. Woodard, Zhongzhao Teng, Kristen Billiar, Dalin Tang, "In Vivo IVUS-Based 3-D Fluid-Structure Interaction Models With Cyclic Bending and Anisotropic Vessel Properties for Human Atherosclerotic Coronary Plaque Mechanical Analysis", IEEE Trans Biomed Eng., 56(10): 2420-2428, 2009. A.V. Kamenskiy, I.I. Pipinos, A.S. Desyatova, Y.E. Salkovskiy, L.Y. Kossovich, I.V. Kirillova, L.A. Bockeria, K.M. Morozov, V.O. Polyaev, Th.G. Lynch, Y.A. Dzenis, "Finite Element Model of the Patched Human Carotid", Vasc Endovascular Surg, 43(6):533-541, 2009. W. Koh, S. Kang, M. Cho and J.Y. Yoo, "Three-dimensional steady flow in non-linear elastic collapsible tubes", Proc. ASME 2009 Fluids Engineering Division Summer Meeting, 2009. B. Buriev, T. Kim and T. Seo, "Fluid-structure interactions of physiological flow in stenosed artery", Korea-Australia Rheology Journal, 21(1):39-46, 2009. A. Raman, R. Reifenberger, J. Melcher, and R. Tung, "Cantilever Dynamics and Nonlinear Effects in Atomic Force Microscopy", Noncontact Atomic Force Microscopy, S. Morita et al. (eds. ), NanoScience and Technology, 361-395, 2009. K. Nilsson, "Some Experiences from HDR V31.1 and Applied LOCA Analyses on BWR and PWR", Proc. 20th International Conference on Structural Mechanics in Reactor Technology (SMiRT 20), 2009. Y. Zhou, Q.-L. Zhang, and Z.-H. Liu, "Numerical Simulation of Fluid-Structure Interaction for Wind-induced Dynamic Response of Jinan Yellow River Cable-stayed Bridge in Cantilever State", Proc. International Conference on Engineering Computation, DOI 10.1109/ICEC.2009.49:51-54, 2009. A. Valencia, J. Munizaga, R. Rivera, and E. Bravo, "Numerical Investigation of the Hemodynamics in Anatomically Realistic Lateral Cerebral Aneurysms", Proc. 32nd Annual International Conference of the IEEE EMBS, pp. 2616-2621, 2009. X. Wang, R. Gordnier, S. Ji, and K.J. Bathe, "A Study of 2D+ Airfoil FSI Models with Different FSI Approaches", Proc. 50th AIAA/ASME/ASCE/AHS/ASC Structures, Structural Dynamics, and Materials Conference, AIAA 2009-2573, 2009. M. Eswaran, U.K. Saha, D. Maity, "Effect of baf?es on a partially ?lled cubic tank: Numerical simulation and experimental validation", Computers and Structures, 87:198-205, 2009. K.-N. Song, Y.-W. Kim, S-C Park, "Analysis Of FIV Characteristics On A Coaxial Double-Tube Type Hot Gas Duct For The VHTR", Proc. 16th International Conference on Nuclear Engineering (ICONE17), July 12-16, Brussels, Belgium , ICONE17-75007, 2009. J. Zheng, D.R. Abendschein, R.J. Okamoto, D. Yang, K.S. McCommis, B. Misselwitz, R.J. Gropler, D. Tang , "MRI-based biomechanical imaging: initial study on early plaque progression and vessel remodeling", Magnetic Resonance Imaging, 27:1309-1318, 2009. H. Zhang and K.J. Bathe, "A Mesh Adaptivity Procedure for CFD and Fluid-Structure Interactions", Computers and Structures, 87:604-617, 2009. J. Degroote, K.J. Bathe and J. Vierendeels, "Performance of a New Partitioned Procedure versus a Monolithic Procedure in Fluid-Structure Interaction", Computers and Structures, 87:793-801, 2009. M. Arab-Ghanbari, M.M. Khani, A. Arefmanesh, F. Tabatabai-Ghomshe, "Analysis of blood turbulent flow in carotid artery including the effects of mural thrombosis using finite element modeling", American Journal of Applied Sciences 6 (2): 337-344, 2009. A.A. Linninger, B. Sweetman, and R. Penn, "Normal and hydrocephalic brain dynamics: the role of reduced cerebrospinal fluid reabsorption in ventricular enlargement", Annals of Biomedical Engineering, 37(7): 1434-1447, 2009. A. Valencia, P. Torrens, R. Rivera, M. Galvez, E. Bravo, "A mechanical study of patient-specific cerebral aneurysm models: The correlations between stress and displacement with geometrical indices", Mechanics Research Communications, 36:642-651, 2009. H.F. Liu, X.Y. Luo, Z.X. Cai and T.J. Pedley, "Sensitivity of unsteady collapsible channel flows to modelling assumptions", Commun. Numer. Meth. Engng, 25:483-504, 2009. N. Bouaanani , F.Y. Lu, "Assessment of potential-based fluid finite elements for seismic analysis of dam-reservoir systems", Computers and Structures, 87:206-224, 2009. C. Niklasch, N. Herrmann, "Nonlinear fluid-structure interaction calculation of the leakage behaviour of cracked concrete walls", Nuclear Engineering and Design, 239:1628-1640, 2009. K.M. Khanafer, J. L. Bull, R. Berguer, "Fluid-structure interaction of turbulent pulsatile flow within a flexible wall axisymmetric aortic aneurysm model", European Journal of Mechanics - B/Fluids, 28:88-102, 2009. H.Y. Chen, J.A. Navia, and G.S. Kassab, "A Simulation of Vessel-Clamp Interaction: Transient Closure Dynamics", Annals of Biomedical Engineering, 37(9): 1772-1780, 2009. D. Tang, Z. Teng, G. Canton, T.S. Hatsukami, L. Dong, X. Huang and C. Yuan, "Local critical stress correlates better than global maximum stress with plaque morphological features linked to atherosclerotic plaque vulnerability: an in vivo multi-patient study", BioMedical Engineering OnLine, 8:15, 2009. X. Huang, C. Yang, C. Yuan, F. Liu, G. Canton, J. Zheng, P.K. Woodard, G.A. Sicard, and D. Tang, "Patient-Specific Artery Shrinkage and 3D Zero-Stress State in Multi-Component 3D FSI Models for Carotid Atherosclerotic Plaques Based on In Vivo MRI Data", Mol Cell Biomech., 6(2):121-134, 2009. A. Valencia, F. Baeza, "Numerical simulation of fluid-structure interaction in stenotic arteries considering two layer nonlinear anisotropic structural model", International Communications in Heat and Mass Transfer, 36:137-142, 2009. M.-H. Moosavi, N. Fatouraee, H. Katoozian, "Finite element analysis of blood flow characteristics in a Ventricular Assist Device (VAD)", Simulation Modelling Practice and Theory, 17:654-663, 2009. K.H. Yoon, J.Y. Kim, K.H. Lee, Y.H. Lee, H.K. Kim, "Control rod drop analysis by finite element method using fluid-structure interaction for a pressurized water reactor power plant", Nuclear Engineering and Design, 239:1857-1861, 2009. K. Khanafer, R. Berguer, "Fluid-structure interaction analysis of turbulent pulsatile flow within a layered aortic wall as related to aortic dissection", Journal of Biomechanics, 42:2642-2648, 2009. D. Tang, C. Yang, "3D MRI-Based Anisotropic FSI Models With Cyclic Bending for Human Coronary Atherosclerotic Plaque Mechanical Analysis", J. Biomech. Eng., 131(6): 061010, 2009. P. Rissland, Y. Alemu, S. Einav, J. Ricotta, D. Bluestein, "Abdominal Aortic Aneurysm Risk of Rupture: Patient-Specific FSI Simulations Using Anisotropic Model", J. Biomech. Eng., 131(3): 031001, 2009. D. Tang, Z. Teng, G. Canton, C. Yang, M. Ferguson, X. Huang, J. Zheng, P.K. Woodard, C. Yuan, "Sites of Rupture in Human Atherosclerotic Carotid Plaques Are Associated With High Structural Stresses – An In Vivo MRI-Based 3D Fluid-Structure Interaction Study", Stroke, 40:3258, 2009. T. Moghani, J. Butler, S. Loring, "Determinants of friction in soft elastohydrodynamic lubrication", Journal of Biomechanics, Vol. 42, Issue 8, pp. 1069-1074, 2009. A. Van Hirtum, J. Cisonni and X. Pelorson, "On quasi-steady laminar flow separation in the upper airways", Commun. Numer. Meth. Engng, 25:447-461, 2009. T.Q. Le, D. Byun, Y.H. Yoo, J.H. Ko, H.C. Park, "Experimental and Numerical Investigation of Beetle Flight", Proceedings of the 2008 IEEE International Conference on Robotics and Biomimetics, 234-239, 2009. C.D. Bertram, L.E. Bilston and M.A. Stoodley, "Tensile radial stress in the spinal cord related to arachnoiditis or tethering: a numerical model", Med Biol Eng Compu, 46:701-707, 2008. Loumes L., Avrahami, I.,and M. Gharib, M., "Resonant pumping in a multilayer impedance pump", Physics Of Fluids, 20:023103, 2008. A.C. Mendes, H.J.D. Correia, "Fluid-structure interaction for a jacket model structure with imposed displacement", Proc. Eighteenth Int. Offshore and Polar Eng. Conf., 2008. D. Liu, S. Liu, Y. Wu and X. Liu, "Numerical Simulation of Hydraulic Turbine Based on Fluid-Structure Coupling", Proc. The 4th International Symposium on Fluid Machinery and Fluid Engineering, 345-351, 2008. B. Klarin, "Adaptive airfoils for wind turbine blades", Proc. EWEC2008, European Wind Energy Association, 2008. W.G. Li, X.Y. Luo, S.B. Chin, N.A. Hill, A.G. Johnson, and N.C. Bird, "Non-Newtonian Bile Flow in Elastic Cystic Duct: One- and Three-Dimensional Modeling", Annals of Biomedical Engineering, 36(11): 1893-1908, 2008. D. Tang, C. Yang, S. Mondal, F. Liu, G. Canton, T.S. Hatsukami, C. Yuan, "A Negative Correlation between Human Carotid Atherosclerotic Plaque Progression and Plaque Wall Stress: In Vivo MRI-Based 2D/3D FSI Models", J Biomech., 41(4): 727-736, 2008. C.Y. Chee, H.P. Lee, C. Lu, "Using 3D fluid-structure interaction model to analyse the biomechanical properties of erythrocyte", Physics Letters A 372:1357-1362, 2008. Q.-L. Zhang, Z.-H. Liu, Y. Zhou, "Numerical simulation of fluid-structure interaction for wind induced dynamic response of the 3rd Jinan Yellow River cable stayed bridge", Proc. 6th Int. Conf. on Computation of Shell and Spatial Structures, IASS-IACM 2008: Spanning Nano to Mega, Cornell University, Ithaca, NY, USA, 2008. A. Borghi, N.B. Wood, R.H. Mohiaddin, X.Y. Xu, "Fluid-solid interaction simulation of flow and stress pattern in thoracoabdominal aneurysms: A patient-specific study", Journal of Fluids and Structures, 24:270-280, 2008. V. Meruane, R. Pascual, "Identification of nonlinear dynamic coefficients in plain journal bearings", Tribology International, 41:743-754, 2008. I. Avrahami and M. Gharib, "Computational studies of resonance wave pumping in compliant tube", J. Fluid Mech., 608:139-160, 2008. C. Yang, D. Tang, S. Kobayashi, J. Zheng, P.K. Woodard, Z. Teng, R. Bach, and D.N. Ku, "Cyclic Bending Contributes to High Stress in a Human Coronary Atherosclerotic Plaque and Rupture Risk: In Vitro Experimental Modeling and Ex Vivo MRI-Based Computational Modeling Approach", Mol Cell Biomech., 5(4): 259-274, 2008. D. Bluestein, Y. Alemu, I. Avrahami, M. Gharib, K. Dumont, J. J. Ricotta, S. Einav, "Influence of microcalcifications on vulnerable plaque mechanics using FSI modeling", Journal of Biomechanics 41:1111-1118, 2008. A. Valencia, D. Ledermann, R. Rivera, E. Bravo and M. Galvez, "Blood flow dynamics and fluid-structure interaction in patient-specific bifurcating cerebral aneurysms", Int. J. Numer. Meth. Fluids, 58:1081-1100, 2008. Y. Cai and Z. Zhao, "Modeling the dynamic process of tsunami earthquake by liquid-solid coupling model", Acta Seismologica Sinica, Vol.21 No.6 (598-607), 2008. M.G. Doyle, J.-B. Vergniaud, S. Tavoularis, and Y. Bourgault, "Numerical Simulations of Blood Flow in Artificial and Natural Hearts With Fluid-Structure Interaction", Artificial Organs, 32(11):870-879, 2008. J.Y. Kim, H. Park, K.H. Kwon, J.Y. Park, J.Y. Baek, T.S. Lee, H.R. Song, Y.D. Park, S.H. Lee, "A cell culturing system that integrates the cell loading function on a single platform and evaluation of the pulsatile pumping effect on cells", Biomed Microdevices, 10:11-20, 2008. C. Yang, D. Tang, T. Geva, P.J. del Nido, "MRI-Based Patient-Specific Computational Modeling of Right Ventricular Response to Pulmonary Valve Insertion Surgery: A Passive Anisotropic FSI Model with Fiber Orientation", Proc. 2008 International Conference on BioMedical Engineering and Informatics, pp.160-167, 2008. D. Tang, C. Yang, "Patient-Specific MRI-Based 3D FSI RV/LV/Patch Models for Pulmonary Valve Replacement Surgery and Patch Optimization", J. Biomech. Eng., Vol. 130, Issue 4, 041010, 2008. G.P. Ong, T.F. Fwa, "Modeling and Analysis of Truck Hydroplaning on Highways", Journal of the Transportation Research Board, 2068: 99-108, 2008. D.E. Mazur, K.R. Osterholzer, J.M. Toomasian, S.I. Merz, "A Novel, Low Cost, Disposable, Pediatric Pulsatile Rotary Ventricular Pump For Cardiac Surgery that Provides a Physiological Flow Pattern", ASAIO Journal, 54(5): 523-528, 2008. T.F. Fwa, G.P. Ong, "Wet-Pavement Hydroplaning Risk and Skid Resistance: Analysis", J. Transp. Engrg., 134(5): 182-190, 2008. S. Basak, A. Beyder, C. Spagnoli, A. Raman, and F.Sachs, "Hydrodynamics of torsional probes for atomic force microscopy in liquids", Journal Of Applied Physics, 102:024914-1—024914-7, 2007. J. Wang, G.A. Tetlow, A.D. Lucey, J.J. Armstrong, M.S. Leigh, A. Paduch, D.D. Sampson, J.H.Walsh, P.R. Eastwood, D.R. Hillman, and S. Harrison, "Dynamics of the human upper airway: On the development of a three-dimensional computational model", IFMBE Proceedings, Vol. 14/5:3442-3452, 2007. H.L. Dailey, H.C. Yalcin, S.N. Ghadiali, "Fluid-structure modeling of ?ow-induced alveolar epithelial cell deformation", Computers and Structures, 85:1066-1071, 2007. G.P. Ong, T.F. Fwa, "Wet-Pavement Hydroplaning Risk and Skid Resistance: Modeling", J. Transp. Engrg., 133(10): 590-598, 2007. C. Yang, D. Tang, C. Yuan, T.S. Hatsukami, J. Zheng, P.K. Woodard, "In Vivo/Ex Vivo MRI-Based 3D Non-Newtonian FSI Models for Human Atherosclerotic Plaques Compared with Fluid/Wall-Only Models", Comput Model Eng Sci., 19(3): 233-246, 2007. K.J. Bathe and G.A. Ledezma, "Benchmark Problems for Incompressible Fluid Flows with Structural Interactions", Computers and Structures, 85:628-644, 2007. C.M. Scotti, E.A. Finol, "Compliant biomechanics of abdominal aortic aneurysms: A ?uid-structure interaction study", Computers and Structures, 85 1097-1113, 2007. X. Wang, L.B. Wang, "Dynamic analysis of a water-soil-pore water coupling system", Computers and Structures, 85:1020-1031, 2007. J.L. Almazan, F.A. Cerda, J.C. De la Llera, D.Lopez-Garcia, "Linear isolation of stainless steel legged thin-walled tanks", Engineering Structures, 29:1596-1611, 2007. Q. Jin, X. Li, N. Sun, J. Zhou, J. Guan, "Experimental and numerical study on tuned liquid dampers for controlling earthquake response of jacket offshore platform", Marine Structures, 20:238-254, 2007. X. Luo, B. Calderhead, H. Liu, W.Li, "On the initial con?gurations of collapsible channel ?ow", Computers and Structures, 85:977-987, 2007. S.L. Thomson, L. Mongeau, S.H. Frankel, "Flow over a membrane-covered, ?uid-?lled cavity", Computers and Structures, 85:1012-1019, 2007. C. Ko and T.D. Brown, "A fluid-immersed multi-body contact finite element formulation for median nerve stress in the carpal tunnel", Comput Methods Biomech Biomed Engin., 10(5): 343-349, 2007. A. Liu, S. Rugonyi, J.O. Pentecost, K.L. Thornburg, "Finite element modeling of blood flow-induced mechanical forces in the outflow tract of chick embryonic hearts", Computers and Structures, 85:727-738, 2007. C. Yang, D. Tang, I. Haber, T. Geva, P.J. del Nido, "In vivo MRI-based 3D FSI RV/LV models for human right ventricle and patch design for potential computer-aided surgery optimization", Computers and Structures, 85:988-997, 2007. T. Moghani, J.P. Butler, J. L.-W. Lin, S.H. Loring, "Finite element simulation of elastohydrodynamic lubrication of soft biological tissues", Computers and Structures, 85:1114-1120, 2007. A. Jana, A. Raman, B. Dhayal, S.L. Tripp, and R.G. Reifenberger, "Microcantilever mechanics in flowing viscous fluids", Appl. Phys. Lett., 90, 114110, 2007. H.L. Dailey, S.N. Ghadiali, "Fluid-structure analysis of microparticle transport in deformable pulmonary alveoli", Aerosol Science, 38:269 - 288, 2007. J. Wang, G.A. Tetlow and A.D. Lucey, "Flow-Structure Interaction in the Upper Airway: Motions of a Cantilevered Flexible Plate in Channel Flow with Flexible Walls", Proc. 16th Australasian Fluid Mechanics Conference, 2007. S.L. Thomson, J.W. Tack, G.J. Verkerke, "A numerical study of the flow-induced vibration characteristics of a voice-producing element for laryngectomized patients", Journal of Biomechanics, 40:3598-3606, 2007. T.-H.Cheng, I.-K. Oh, "Fluid-Structure Coupled Analyses of Composite Wind Turbine Blades", Advanced Materials Research, Vols. 26-28, pp 41-44, 2007. A. Borghi, N.B Wood, R.H Mohiaddin and X.Y. Xu, "3D geometric reconstruction of thoracic aortic aneurysms", BioMedical Engineering OnLine, 5:59, 2006. A.Arablouei, A.R.M. Gharabaghi, K.Abedi, A.Ghalandarzadeh, "The Dynamic Response Of Gravity Type Quay Wall During Earthquake Including Soil-Sea-Structure Interaction", Proc. 7th International Congress on Civil Engineering, 2006. S. Wright, M. Gartner, J. Speakman, J. Tamblyn, F. Pigula, "Design of a perfusion system for fetal cardiopulmonary bypass", Journal of Biomechanics, Vol. 39, Supp. 1, p. S256, 2006. C.J. Flannery, A. Para, D.N. Ku, "Shear dependant platelet accumulation in hemodynamic stenoses", Journal of Biomechanics, Vol. 39, Supp. 1, p. S256, 2006. Y. Zhang, W.-B. Shangguan, "A novel approach for lower frequency performance design of hydraulic engine mounts", Computers and Structures, 84(8-9): 572-584, 2006. D. Nordsletten, P. Hunter and N. Smith, "Dynamic mesh control for cardiovascular flows", Journal of Biomechanics, Vol. 39, Supp. 1, p. S610, 2006. F. Carneiro, S. Teixeira, J. Teixeira, "Numerical study of a pulsatile flow in the abdominal aorta bifurcation", Journal of Biomechanics, Vol. 39, Supp. 1, p. S610, 2006. M. Li, J. Beech-Brandt, L.R. John, P.R. Hoskins, W.J. Easson, "Fluid-wall coupled simulation of pulsatile blood flow in compliant stenosed arteries", Journal of Biomechanics, Vol. 39, Supp. 1, p. S439, 2006. X. Huang, C. Yang, J. Zheng, P. Woodard, D. Tang, "Quantifying vessel material properties using MRI under pressurized condition and MRI-based FSI models for blood flow in diseased human arteries", Journal of Biomechanics, Vol. 39, Supp. 1, p. S439, 2006. K. Dumont, J. Ricotta, P. Impellizzeri, D. Bluestein, "Influence of thrombus in an abdominal aortic aneurysm using a FEM-FSI model", Journal of Biomechanics, 39: S439-S439, 2006. A. Valencia, M. Villanueva, "Unsteady flow and mass transfer in models of stenotic arteries considering fluid-structure interaction", International Communications in Heat and Mass Transfer, 33:966-975, 2006. J.H. Leung, A.R. Wright, N. Cheshire, J. Crane, S.A. Thom, A.D. Hughes and Y. Xu, "Fluid structure interaction of patient specific abdominal aortic aneurysms: a comparison with solid stress models", BioMedical Engineering OnLine, 5:33, 2006. S. Basak, A. Raman, S.V. Garimella, "Hydrodynamic loading of microcantilevers vibrating in viscous fluids", J. Appl. Phys. 99:114906, 2006. J.D. Humphrey, L.E. Niklason, "Biomechanics of cerebral vasospasm", Journal of Biomechanics, Vol. 39, Supp. 1, p. S438, 2006. I. Avrahami, L. Loumes, M. Gharib, "Numerical investigation of the fluid and structure dynamics in models of impedance pump", Journal of Biomechanics, Vol. 39, Supp. 1, p. S438, 2006. H.S. Udaykumar, S. Vigmostad, S. Krishnan, B. Jeffrey and K.B. Chandran, "Simulation of fluid-structure interactions in prosthetic heart valves using a sharp-interface approach", Journal of Biomechanics, Vol, 39, Supp. 1, p. S438, 2006. Y.Huang, A. Malhotra and D.P. White, "Computational simulation of human upper airway collapse using a pressure-/state-dependent model of genioglossal muscle contraction under laminar flow conditions", J Appl Physiol, 99:1138-1148, 2005. D. Tang, C. Yang, J. Zheng, P.K. Woodard, J.E. Saffitz, J.D. Petruccelli, G.A. Sicard, and C. Yuan, "Local Maximal Stress Hypothesis and Computational Plaque Vulnerability Index for Atherosclerotic Plaque Assessment", Annals of Biomedical Engineering, 33(12):1789-1801, 2005. J. Zheng, I. El Naqa, F.E. Rowold, T.K. Pilgram, P.K. Woodard, J.E. Saffitz, and D. Tang, "Quantitative Assessment of Coronary Artery Plaque Vulnerability by High-Resolution Magnetic Resonance Imaging and omputational Biomechanics: A Pilot Study ex Vivo", Magn Reson Med., 54(6): 1360-1368, 2005. D. Tang, C. Yang, J. Zheng, P.K. Woodard, J.E. Saffitz, G.A. Sicard, T.K. Pilgram, C. Yuan, "Quantifying Effects of Plaque Structure and Material Properties on Stress Distributions in Human Atherosclerotic Plaques Using 3D FSI Models", J Biomech Eng., 127(7): 1185-1194, 2005. C.D. Bertram, A.R. Brodbelt, M.A. Stoodley, "The Origins of Syringomyelia: Numerical Models of Fluid/Structure Interactions in the Spinal Cord", J. Biomech. Eng., 127(7):1099, 2005. E.B. Shim, B.J. Lee, H.J. Ko, "Computational Study on the Hemodynamics of the Bypass Shunt Directly Connecting the left Ventricle to a Coronary Artery", Journal of Mechanical Science and Technology (KSME Int. J. ), 19(5): 1158-1168, 2005. Y. Cheng, H. Oertel, and T. Schenkel, "Fluid-Structure Coupled CFD Simulation of the Left Ventricular Flow During Filling Phase", Annals of Biomedical Engineering, 33(5): 567-576, 2005. M.G. Doyle, S. Tavoularis, Y. Bourgault, "Simulation of close-loop flow in a ventricular assist device coupled with a circulatory system model," Third MIT Conference on Computational Fluid and Solid Mechanics, Elsevier, 1: 972-974, 2005. C.M. Scotti, A.D. Shkolnik, S.C. Muluk, E.A. Finol, "Fluid-structure interaction in abdominal aortic aneurysms: effects of asymmetry and wall thickness", BioMedical Engineering OnLine, 4:64, 2005. S.N. Ghadiali, J. Banks, J.D. Swarts, "Finite Element Analysis of Active Eustachian Tube Function", J Appl Physiol, March 26, 2004. A.H. Chau, R.C. Chan, M. Shishkov, B. Macneill, N. Iftimia, G.J. Tearney, R.D. Kamm, B.E. Bouma, and M.R. Kaazempur-Mofrad, "Mechanical Analysis of Atherosclerotic Plaques Based on Optical Coherence Tomography", Annals of Biomedical Engineering, 32(11):. 1494-1503, 2004. G.S. Jeong, E.B. Shim, H.J. Ko, C.H. Youn, K. Sun, B.G. Min, "Computational analysis of the three-dimensional hemodynamics of the blood sac in the twin-pulse life-support system", J Artif Organs, 7:174-180, 2004. D.L. Tang, C. Yang, J. Zheng, P.K. Woodard, G.A. Sicard, J.E. Saffitz, C. Yuan, "3D MRI-based multicomponent FSI models for atherosclerotic plaques," Annals of Biomedical Engineering, 32 (7): 947-960, 2004. D.L. Tang, C. Yang, S. Kobayashi, D.N. Ku, "Effect of a lipid pool on stress/strain distributions in stenotic arteries: 3-D fluid-structure interactions (FSI) models," Journal of Biomechanical Engineering-Transactions of the ASME, 126 (3): 363-370, 2004. W.B. Shangguan, Z.H. Lu, "Modeling of a hydraulic engine mount with fluid-structure interaction finite element analysis," Journal of Sound and Vibration, 275 (1-2): 193-221, 2004. W.B. Shangguan, Z.H. Lu,"Experimental study and simulation of a hydraulic engine mount with fully coupled fluid-structure interaction finite element analysis model," Computers and Structures, 82 (22): 1751-1771, 2004. J. Chatila, M. Tabbara, "Computational modeling of flow over an ogee spillway," Computers and Structures, 82 (22): 1805-1812, 2004. K.J. Bathe, H. Zhang, "Finite element developments for general fluid flows with structural interactions," International Journal for Numerical Methods in Engineering, 60(1): 213-232, 2004. X. Wang, "Instability analysis of some fluid-structure interaction problems", Computers & Fluids 32:121-138, 2003. D. Tang, C. Yang, S. Kobayashi, J. Zheng, and R.P. Vito, "Effect of Stenosis Asymmetry on Blood Flow and Artery Compression: A Three-Dimensional Fluid-Structure Interaction Model", Annals of Biomedical Engineering, 31:1182-1193, 2003. E.B. Shim, J.Y. Yeo, H.J. Ko, C.H. Youn, Y.R. Lee, C.Y. Park, B.G. Min, and K. Sun, "Numerical Analysis of the Three-Dimensional Blood Flow in the Korean Artificial Heart", Artificial Organs, 27(1):49-60, 2003. A. Gouldstone, R.E. Brown, J.P. Butler, S.H. Loring, "Elastohydrodynamic separation of pleural surfaces during breathing", Respiratory Physiology & Neurobiology, 137:97-106, 2003. R. Kroyer, "FSI analysis in supersonic fluid flow," Computers and Structures, 81 (8-11): 755-764, 2003. M.R. Kaazempur-Mofrad, M. Bathe, H. Karcher, H.F. Younis, H.C. Seong, E.B. Shim, R.C. Chan, D.P. Hinton, A.G. Isasi, A. Upadhyaya , M.J. Powers, L.G. Griffith, R.D. Kamm, "Role of simulation in understanding biological systems," Computers and Structures, 81 (8-11): 715-726, 2003. H. Zhang, X.L. Zhang, S.H. Ji, Y.H. Guo, G. Ledezma, N. Elabbasi, H. deCougny, "Recent development of fluid-structure interaction capabilities in the ADINA system," Computers and Structures, 81 (8-11): 1071-1085, 2003. L. Andersson, P. Andersson, J. Lundwall, J. Sundqvist, K. Nilsson, P. Veber, "On the validation and application of fluid-structure interaction analysis of reactor vessel internals at loss of coolants accidents," Computers and Structures, 81 (8-11): 469-476, 2003. D. Deserranno, Z.B. Popovic, N.L. Greenberg, M. Kassemi, J.D. Thomas, "Axisymmetric fluid-structure interaction model of the left ventricle," Second MIT Conference on Computational Fluid and Solid Mechanics, Elsevier, 2: 1669-1672, 2003. H.F. Younis, M.R. Kaazempur-Mofrad, C. Chung, R.C. Chan, R.D. Kamm, "Computational analysis of the effects of exercise on hemodynamics in the carotid bifurcation," Annals of Biomedical Engineering, 31 (8): 995-1006, 2003. T. Sussman, J. Sundqvist, "Fluid-structure interaction analysis with a subsonic potential-based fluid formulation," Computers and Structures, 81 (8-11): 949-962, 2003. R. Kurihara, "Thermofluid analysis of free surface liquid divertor in Tokamak fusion reactor," Fusion Engineering and Design, 61-2: 209-216, 2002. Y.H. Guo, K.J. Bathe, "A numerical study of a natural convection flow in a cavity," International Journal for Numerical Methods in Fluids, 40 (8): 1045-1057, 2002. A. Malhotra, Y. Huang, R.B. Fogel, G.Pillar, J.K. Edwards, R.Kikinis, S.H. Loring, and D.P. White, "The Male Predisposition to Pharyngeal Collapse Importance of Airway Length", Am J Respir Crit Care Med, 166:1388-1395, 2002. M. Bathe, A. Shirai, C.M. Doerschuk, and R.D. Kamm, "Neutrophil transit times through pulmonary capillaries: The effects of capillary geometry and fMLP-stimulation", Biophysical Journal, 83:1917-1933, 2002. D. Tang, C. Yang, L. Chun, and S.Q. Liu, "Shear stress distributions on the membrane of endothelial cells using 3-D computational modeling with fluid-structure interactions", Proc. Annual International Conference of the IEEE Engineering in Medicine and Biology , 1:375-376, 2002. R. Kroyer, "On some aspects of fluid-structure interaction analysis with respect to aeroelasticity on industrial applications", Proc. First MIT Conference on Computational Fluid and Solid Mechanics, 2:1272-1277, 2001. H. Grebner, C. Müller, J. Sievers, "Structure mechanics and thermal-hydraulic behaviour of a PWR coolant loop with a postulated crack like leakage", Nuclear Engineering and Design, 205:219-225, 2001. H. Huang, R. Virmani, H. Younis, A.P. Burke, R.D. Kamm, R.T. Lee, "The Impact of Calcification on the Biomechanical Stability of Atherosclerotic Plaques", Circulation, 103:1051-1056, 2001. S. Rugonyi, K.J. Bathe, "On the Finite Element Analysis of Fluid Flows Fully Coupled with Structural Interactions", Computer Modeling in Engineering & Sciences, 2:195-212, 2001. H.F. Younis, C.I. Chung, R.D. Kamm, "Challenges in developing an accurate model for carotid bifurcation blood flow and wall mechanics," Proc. First MIT Conference on Computational Fluid and Solid Mechanics, 2:1434-1439, 2001. X. Wang, "Velocity/pressure mixed finite element and finite volume formulation with ALE descriptions for nonlinear fluid-structure interaction problems", Advances in Engineering Software, 31:35-44, 2000. K.J. Bathe, H. Zhang and S. Ji, "Finite Element Analysis of Fluid Flows Fully Coupled with Structural Interactions", Computers and Structures, 72:1-16, 1999. D.L. Tang, C. Yang, Y. Huang, D.N. Ku, "Wall stress and strain analysis using a three-dimensional thick-wall model with fluid-structure interactions for blood flow in carotid arteries with stenoses," Computers and Structures, 72(1-3): 341-356, 1999. X.D. Wang, "Analytical and computational approaches for some fluid-structure interaction analyses," Computers and Structures, 72(1-3): 423-433, 1999. X.D. Wang, "Simulation of a deformable ball passing through a step diffuser," Computers and Structures, 72(1-3): 435-456, 1999. W.I. Moore, E.S. Donovan, C.R. Powers, "Thermal Analysis of automotive lamps using ADINA-F coupled specular radiation and natural convection model," Computers and Structures, 72(1-3): 17-30, 1999. D. Tang, C. Yang, D.N. Ku, "A 3-D thin-wall model with fluid-structure interactions for blood flow in carotid arteries with symmetric and asymmetric stenoses", Computers and Structures,� 72:357-377, 1999. X. Wang, "Analytical and computational approaches for some fluid-structure interaction analyses", Computers and Structures,� 72: 423-433, 1999. D. Tang, C.Yang, Y. Huang, D.N. Ku, "Wall stress and strain analysis using a three-dimensional thick-wall model with fluid-structure interactions for blood flow in carotid arteries with stenoses", Computers and Structures, 72:341-356, 1999. X.D. Wang, Z.F. Feng, L.J. Forney, "Computational simulation of turbulent mixing with mass transfer", Computers and Structures, 70(4): 447-465, 1999. K.J. Bathe, "Fluid-Structure Interactions", Mechanical Engineering, 120(5): 66-68, 1998. X. Wang, K.J. Bathe, "On Mixed Elements for Acoustic Fluid-Structure Interactions", Mathematical Models & Methods in Applied Sciences, 7(3): 329-343, 1997. M. Zmindak and I. Grajciar, "Simulation of the aquaplane problem", Computers and Structures, 64 (5-6): 1155-1164, 1997. X. Wang, "Finite element analysis of air-sheet interactions and flutter suppression devices", Computers and Structures, 64 (5-6): 983-994, 1997. L. Andersson, P. Andersson, "Some experiences in the use of ADINA in the Swedish nuclear industry", Computers and Structures, 64 (5-6): 893-907, 1997. K.J. Bathe, C. Nitikitpaiboon and X. Wang, "A mixed displacement-based finite element formulation for acoustic fluid-structure interaction", Compulers & Structures 56:225-237, 1995. R. Stuart, L. Shipley, A. Ghose and M. Hiremath, "Dynamic analysis of high-level waste storage tanks", Computers and Structures, 56(2/3):415-424, 1995.